A lot the recipes don't sound very appetizing, to be honest. And while this one was bordering on being one of those that didn't, I went for it anyways. I concluded this: they were very tasty but would taste EVEN better if I made several changes next time (entirely revolving around reducing the sweetness, the basic concept of the cake is delicious). For one, I would have added even less sugar to the angel food cake batter because the condensed milk icing is very sweet. 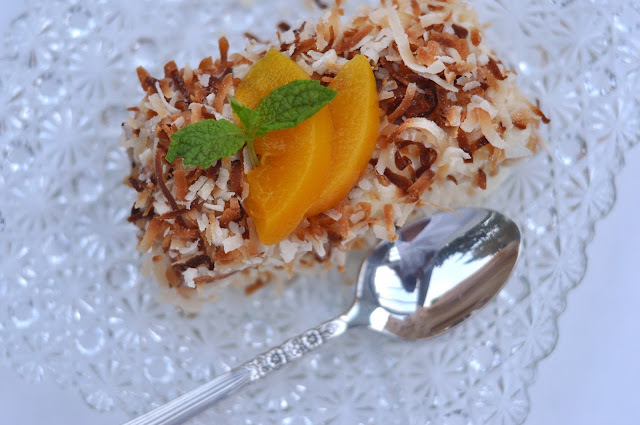 On that note, I would also have made a much greater effort to find unsweetened, shredded coconut. I very highly recommend you do that as well. Lastly, I would probably garnish it with the mint leaves and something more relevant than the canned peaches (I did exactly what they said, and it turned out pretty nonetheless). But for now, if you are up for a diabetic coma, feel free to hop back to 1962 and serve this recipe at your next get together (I really recommend making the above changes though). • Sift the cake flour and first 3/4 cups of sugar (they say 4 times, I did it once and it turned out fine). • Beat the egg whites, cream of tartar, salt and vanilla until soft peaks form, but still gooey and shiny. • Add the next 3/4 cups of sugar, 2 tablespoons at a time, mixing between each addition. • Sift in 1/4 of the flour/sugar mixture and fold with rubber spatula. Sift in the remaining flour/sugar mixture and fold once more. • Pour the batter into two buttered loaf pans and cook at 375º for 35-40 mins. I ended up taking mine out at 32 mins and they were perfectly cooked. • Toast the coconut on a cookie sheet in the oven. I used the broiler option, but be sure to watch very carefully, they will burn easily. • Mix the condensed milk and lemon juice until thick. Add the lemon zest. • Cut your cake into 1 3/4 inch thick slices. • Lay each slice flat and frost with condensed milk mixture. 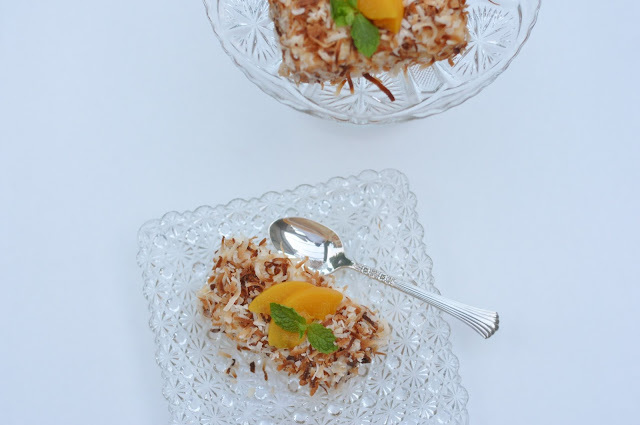 • Generously sprinkle with toasted coconut (and press it onto the sides). 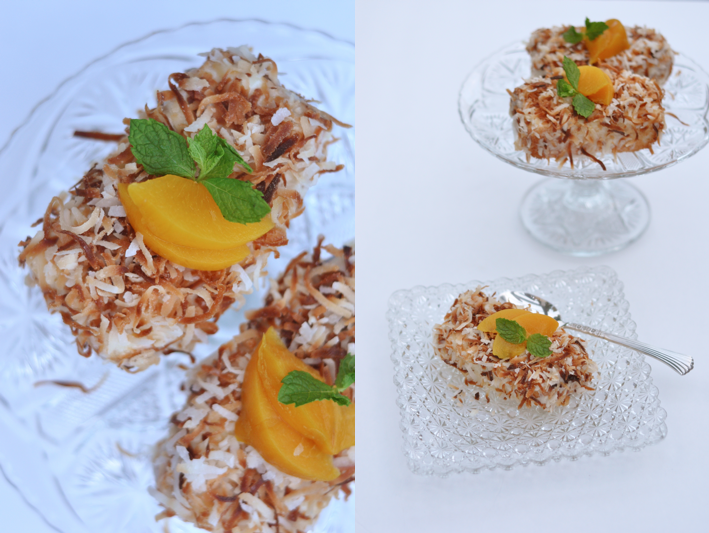 • Garnish with mint and sliced peaches. I love looking at old cookbooks. My boyfriend always wants me to try and create the dishes in them! This looks good. It sounds like it does need the balances you added.